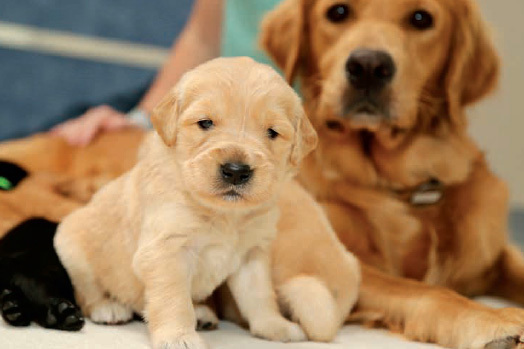 Maternal Style Study: What’s mom’s role in successful assistance dogs? The Canine Early Development Center (CEDC) at Canine Companions for Independence opened in 2015 with the support of Baylor Scott White Healthcare. This new facility has allowed Canine Companions to achieve growth in the number of puppies that enter our programs while providing additional support to our breeder caretakers. The puppies that are born and raised on campus also offer a unique opportunity to participate in research projects that focus on the early weeks of life, which are a critical time for healthy puppy development. 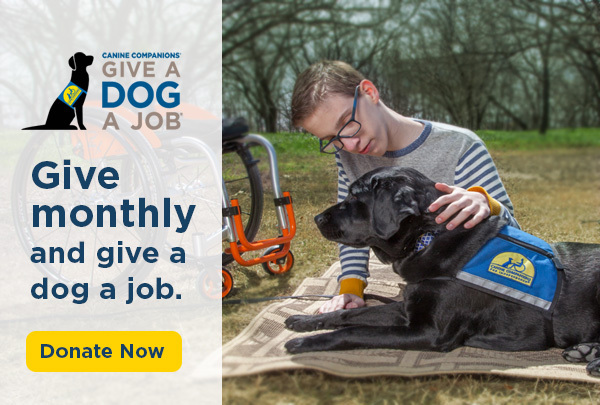 Over the last two years, Canine Companions has worked closely with research collaborators Dr. Evan MacLean, Dr. Emily Bray, and members of the Arizona Canine Cognition Center at the University of Arizona to explore how a puppy’s early abilities are associated with his or her later success as an assistance dog. Recently, in a new project supported by the AKC Canine Health Foundation, they have started looking even earlier in the life course by observing mothers with their litters over the first three weeks post-birth. Past research conducted by Dr. Bray in a population of guide dogs found that the amount of maternal interaction that a puppy was exposed to—via licking, grooming, nursing, contact, and proximity—was significantly associated with that puppy’s success in the guide dog program up to two years later. However, little is known about the long-term influence of maternal care in Canine Companion’s own population. To address this question, over the next two years 60 dams and their litters will enroll in an observational maternal style study to elucidate the relationship between maternal care and puppy behavior, temperament, and success. From birth, every study puppy will wear a unique color-coded and marked collar so that they will be individually identifiable in video recordings, night and day. That will allow us to determine if experiences with the mother vary or stay constant across pups in a litter, and how that may relate to each specific puppy’s later outcome. At eight weeks of age, puppies will participate in temperament and cognitive tests to assess their early behavioral tendencies and problem-solving skills. Canine Companions offers a unique opportunity to explore the effect of early rearing environment on mothering style and puppy behavior. By comparing litters whelped and reared in breeder caretaker homes with those at the CEDC, we hope to learn more about which components of each environment are important to development, and how both environments can be enhanced. Finally, temperament and hormone profiles of the dams will be evaluated pre-pregnancy, searching for associations between maternal biology, personality, and subsequent mothering style. In doing this research, our hope is to ultimately identify objective measures through which Canine Companions can select dams best suited to motherhood in the most beneficial environments. This will allow us to prioritize and improve the dogs’ health, happiness, and quality of life, as well as enhance the puppies’ ability to effectively grow into their working role.